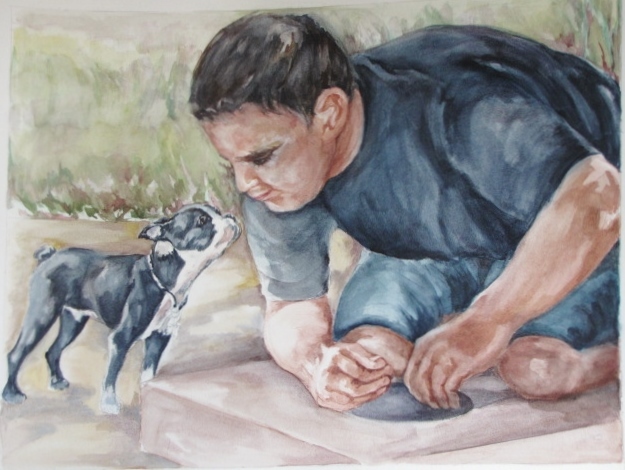 This is the second stage of a drawing of our grandson Joe and his dog Frankie. I am using mixed media to intensify my work. This pairs colored pencil with watercolor. I am enjoying the looseness the washes add. The next stage will be the addition of colored pencil to add greater clarity. Corrections still need to be made. The composition of Joe working on a project and his Boston Terrier giving him a kiss is an unusual one. You are currently reading Watercolor Washes of Joe and Frankie at Dr. Mary McNaughton and Drawing.